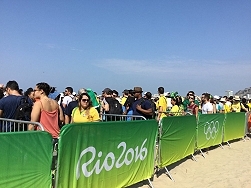 LiveU supplies video uplink solutions at Rio 2016. Rio de Janeiro, August 2016: [Source: LiveU] LiveU is bringing home entertainment gold to its customers and their audiences by providing over 80 international broadcasters with LiveU equipment to cover the Summer Olympics in Rio. The company is expecting approximately 15,000+ live video sessions to take place during the Olympics using its technology. LiveU is the live streaming solution of choice for global news and sports broadcasters and online content creators as the technology provides the highest quality stream, works flawlessly in challenging environments and offers a wide array of bandwidth options across multiple venues presented by the 2016 Rio de Janeiro Olympics. LiveU’s elite support team will be onsite in numerous venues, offering onsite 24/7 support in multiple languages throughout the Games. And for added reliability and accessibility, LiveU will offer multiple dedicated Wi-Fi hotspots near the two main stadiums in Barra and the Maracanã, as well in the International Broadcast Center (IBC). LiveU will also have a special correspondent on the ground in Rio sharing updates on how its customers are using the technology to go live from the Games.